Jennifer Vinegar Avery, James Allen Swainbank, Hundred, and Valerie Alverado engage audiences in an interactive performance thick with symbolism and chaos. 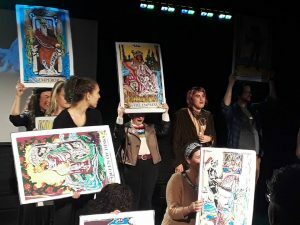 The Gloom Cake artists are obsessed with play and radical inclusion, and the cards in their tarot are 20 x 30 inches large. These big cards provide the choreographic architecture for a spontaneous, interactive dance divination co-performed by Gloom Cake and its audience. One-on-one readings will be available before and after the performance by donation.